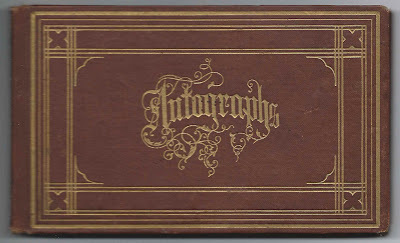 Autograph album of Lizzie Witmore of Ohio, apparently filled out when while she was spending the summer at Dansville, New York at the famous meeting center "Our Home on the Hillside". 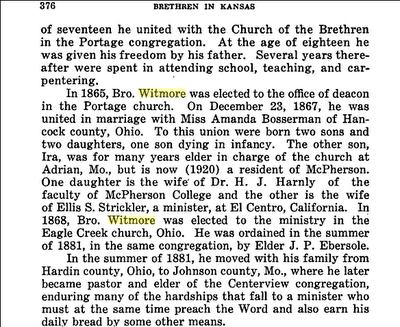 Lizzie was the daughter and sister of Dunkard preachers. Her parents were Rev. 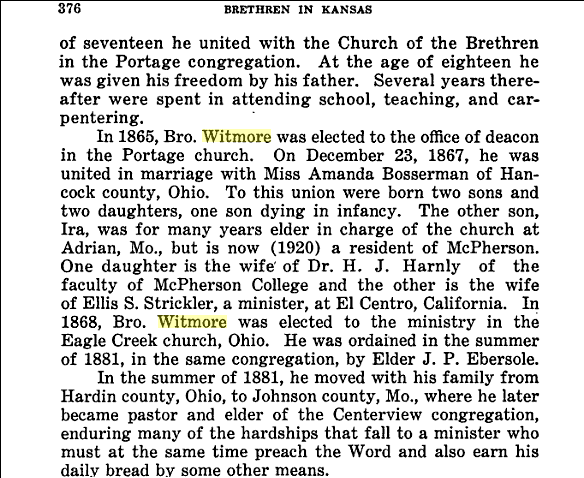 Jonathan Witmore and, I think, his third wife Susan Smith. Her half brother Rev. Jacob Witmore and his wife Amanda (Bosserman) Witmore signed pages in her album. 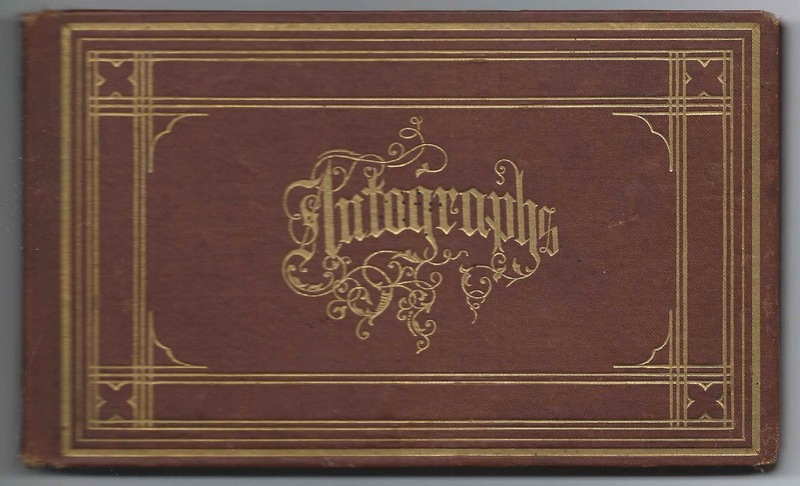 Two other people named Bosserman signed pages in Lizzie's album. 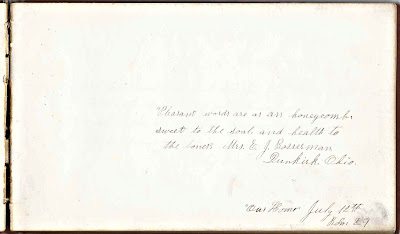 Mrs. E. J. Bosserman of Dunkirk, Ohio, signed a page in 1877 at "Our Home", at Dansville, New York. 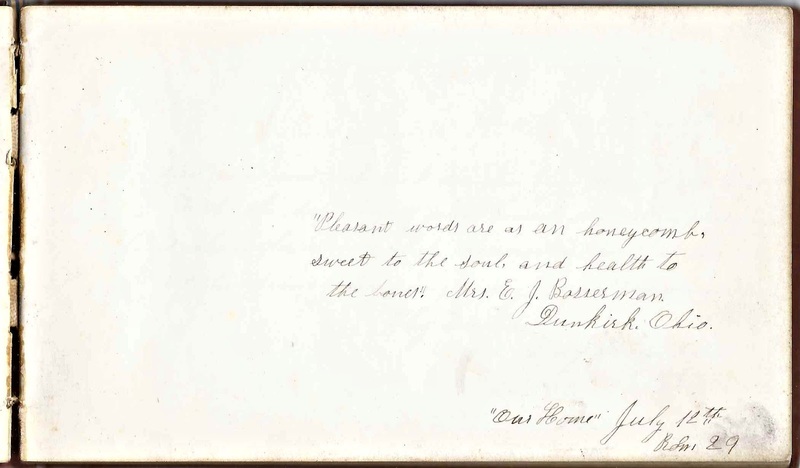 S. T. Bosserman of Dunkirk, Ohio, signed a page in 1877 at "Our Home" at Dansville, New York. 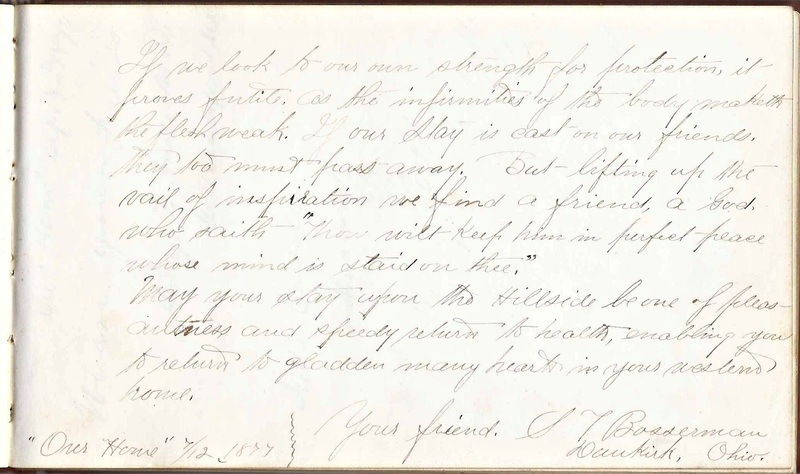 There's a bit of information online about Lizzie's father and brother, and other relatives, but not much on Lizzie. Perhaps she was at Dansville, New York, while her father was preaching there, or perhaps she was involved in activities on her own. She would have been about 22 in 1877. 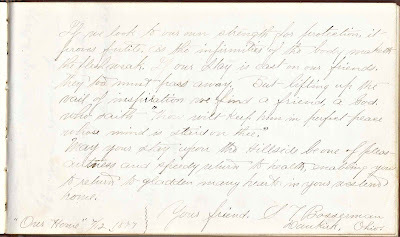 She may have been the Lizzie who married Jacob Smith, another Ohio native, not long after she collected the autographs for her album. 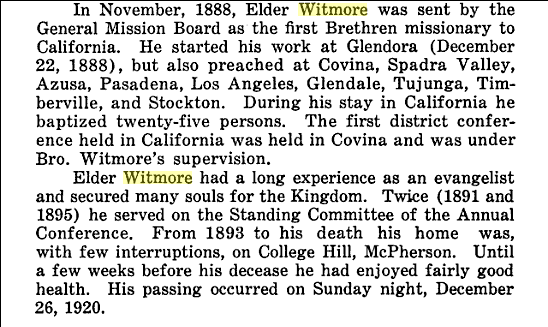 If you have information on Lizzie Witmore, please leave a comment or contact me directly. Thanks! The album is approximately 7" x 4" and contains the names of over 70 people from the United States and Canada, with a few of them sharing pages. 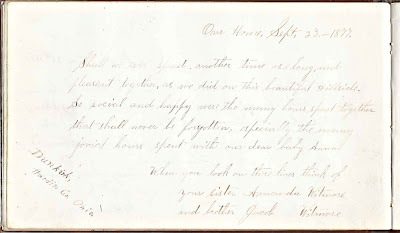 Stella H. Bartlett of Sandwich, Illinois; signed at "Our Home"
Maltie Elliott of Clifty, Indiana, signed at "Our Home" at Dansville, New York in 1877. 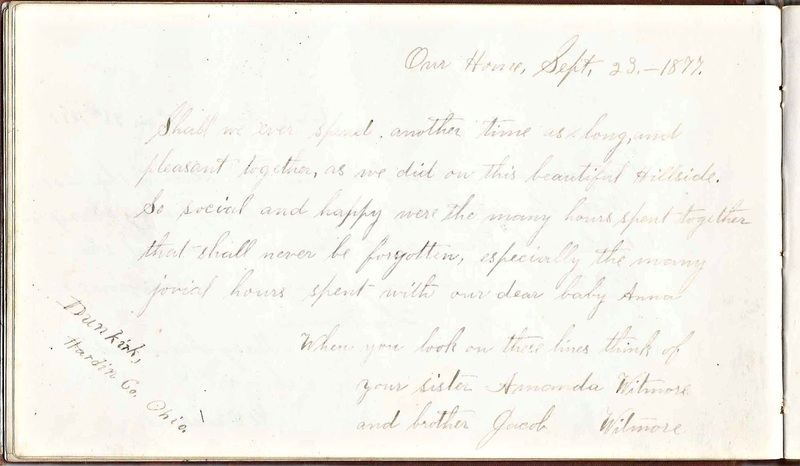 Charles E. Smith of Delavan, Wisconsin; signed at "Brightside, Our Home", 1877; "Hillside Home"
Jacob and Amanda (Bosserman) Witmore of Dunkirk, Ohio; signed at "Our Home" at Dansville, New York, 1877. 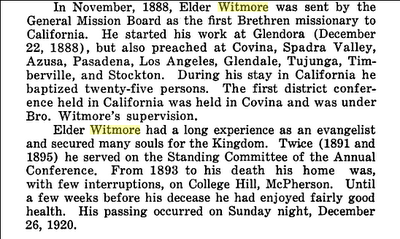 Jacob Witmore was Lizzie Witmore's brother. That was Lizzie who married Jacob Smith in 1928, and she was the daughter of Susan Smith who married Jonathan in 1852. Here is Jonathan's marriage, Lizzie's marriage, and Lizzie's death, all images, from familysearch. Informant was a Leland Smith from Detroit, MI. Oops, try again. She married in 1878 and died in 1928.